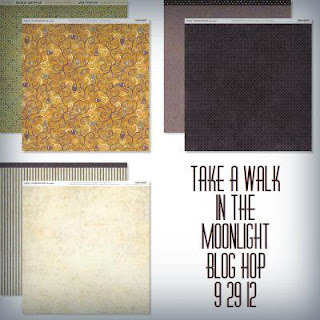 Celebrate Crafts: "TAKE A WALK IN THE MOONLIGHT"
The next stop on your moonlight walk is Back at the beginning with Lucy. You are at the last stop on this hop! For my project, I chose a card. I had been wandering around pinterest, and I saw a card using the dahlia fold. I needed a card for my team card swap, and I thought that this was perfect! The backround paper is from the Dakota paper pack, the card base is CTMH craft paper, cut to 4 1/4 x 5 1/2. I used CTMH burlap ribbon to wrap around the back round paper. There are 8 petals glued to a smaller circle, then that is glued to the burlap ribbon using double sided tape. The center of the flower has a clear button, a tan button and a little bling, all CTMH. The dahlia folds are great! I live how you used them on the card. Love the Flower! Great job! I love the flower! Such a great embellishment to your pretty card. Such a pretty fall card! I love the colors in this one with the neutrals. I am going to have to pair up those papers in some way now! What else can one say about this fabulous card?!!? It's fabulous!!!! !